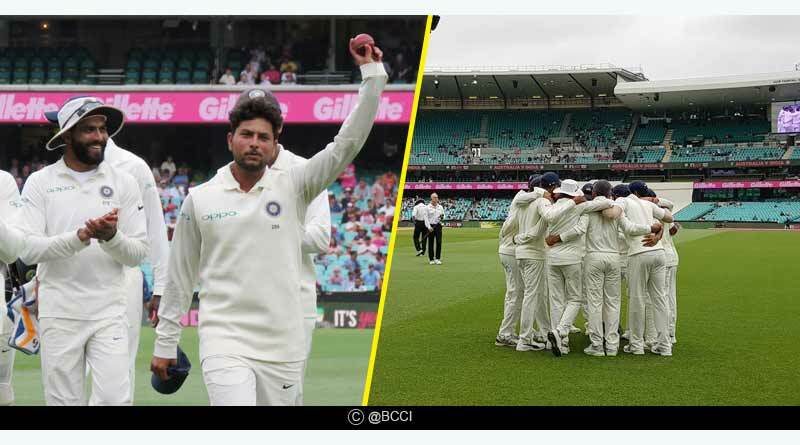 It was another comprehensive day for the Indian cricket team with the twin spin combination of Ravindra Jadeja and Kuldeep Yadav using their variation and guile to mix deliveries up and trap Australia with their trickery on Day 3. Chasing India’s massive 622, Australia faltered terribly, throwing away their wickets to end the day on 236-6, still trailing India by 386 with a follow-on looming on the horizon for them. The first session promised a lot for Australia for the day. 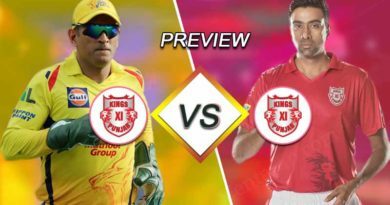 Marcus Harris and Marnus Labuschagne stuck it out in the opening exchanges of Day 3, playing well to negotiate India’s bowlers who were pitching the ball on all the dream spots to get the ball to dance to their tunes. Ravindra Jadeja and Mohammed Shami were the standout performances for India in the pre-lunch session, getting the ball to deviate after hitting the pitch but Marcus Harris was up to the task of facing them with relative ease. Harris showed intent and purpose, carrying on from his form of Day 2, in an innings of 79 that saw him hit the ball smoothly. It was a well-constructed inning, one that saw him send the ball to the boundary on more than one occasion and see Australia go into the first break of the day to register the first green colour in the sessions. Giving him stable company at the order was spinning all-rounder Labuschagne who despite looking tepid and vary in the opening part of his innings did well to eventually see out a nervous initial period and stick it out to put on a 5 run stand. At 128-1, it looked like Australia could get close to India’s daunting total before it all started falling apart for the hosts. Harris fell soon after the lunch break with Jadeja castling him in what was a nothing shot, one that surprised everyone especially given the way Harris was set in the middle. Sticking to their guns, India’s tactics of pursuing with their plan saw them reap the dividends with Shaun Marsh following soon after Harris’ dismissal, once again to Jadeja whose first wicket lead to two for him. It was Labuschagne’s wicket that put the final nail in Australia’s bid to move close to India’s total. The way the wicket came about for India left us all impressed. There was immaculate planning a couple of balls before Labuschagne was dismissed, with Virat Kohli and the Indian side setting up the wicket that soon followed. Proactive and impressive captaincy from Kohli saw him place Rahane in the short mid-on region, seeing that it was an area that Labuschagne was using to break free against the spinners. The immediate next ball saw Labuschagne try to open his arms, sending the ball straight into Rahane’s hands that pulled off an astounding catch to wrap up what was without a doubt the best wicket on the day for India. Three quick wickets saw Australia slump from a strong position to 152-4, losing three wickets in just the space of 24 runs. Head played a cameo of 20 runs before handing over his wicket to Yadav. The adnominal way, in which Paine threw his wicket away, playing a lazy shot to open a gaping gap between his pad and bat to see Yadav’s deliver knock over his stumps highlighted Australia’s shambles of a batting display on Australia Vs India Test 4 Day 3. While India had bowled smartly throughout the day, it was a wicket that wasn’t doing much for the bowlers. There was not much spin and once you applied yourself in the middle, scoring runs was an easy task. Losing wickets one after another on this track will leave the Australian’s dejected who have only themselves to blame for the dire straits they find their first innings in. Before rain eventually lashed the stadium to interrupt play, Cummins and Handscomb had stitched together a partnership to ensure Australia saw themselves crawl past the 200 run mark. 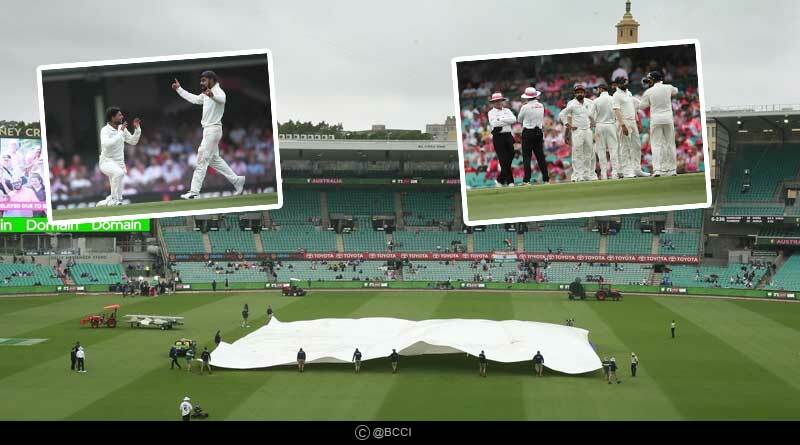 The widespread rainfall left India frustrated who was moving in for the kill, having Australia on the mat on a day that saw them win the first session of the test match on the credit of a side’s bowlers. 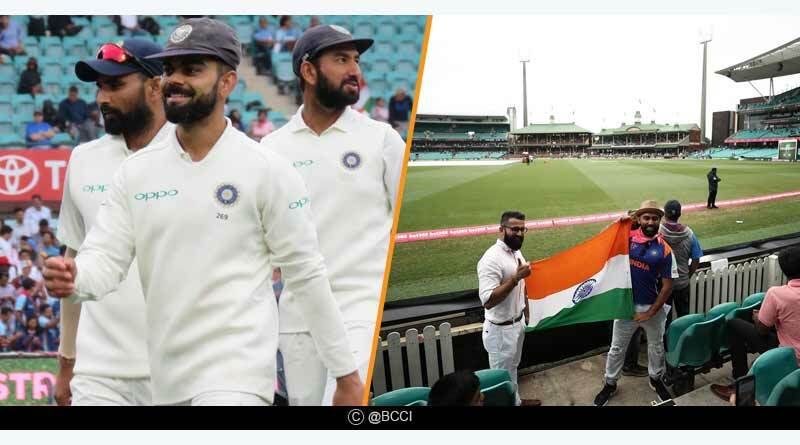 For more articles like Australia Vs India Test 4 Day 3, do Subscribe to our newsletter and follow us on Facebook, Twitter and Google+.